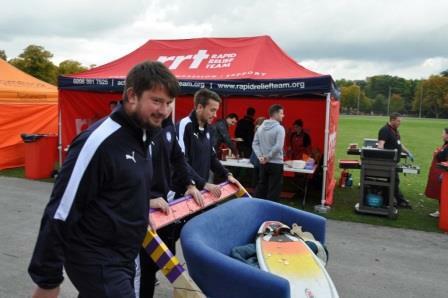 Sofa with surf-board pushed by volunteers past the Cricket Pavillion, Queens Park Chesterfield. 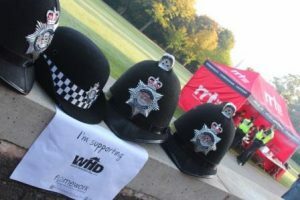 The World Homeless Day in Chesterfield on Thursday 8th October was a truly amazing 24-hour event with communities coming together from all over Derbyshire to support the homeless and vulnerable! 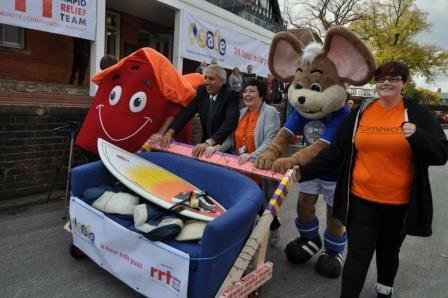 SAFE housing mascot (left), Deputy Police Crime Commissioner, Hardyal Dhindsa (second from left), SAFE Service Manager & Consortia Lead, Sue Wood (Centre), with Chesterfield FC “Chester the Mouse” and Megan (a community member representing those the event was supporting) pushing the Sofa Surf. 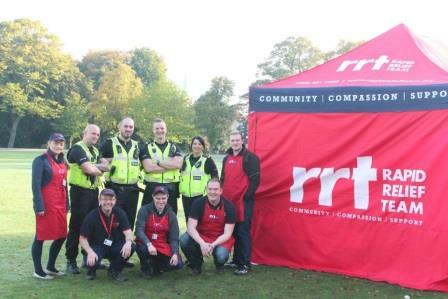 On Thursday 8th and Friday 9th October Rapid Relief Team carried out shifts covering 24 hours in Queens Park Chesterfield supporting SAFE, part of the Framework HA Charity to mark the World Homeless Day (WHD). The event brought communities together from Buxton, High Peak, Matlock, Chesterfield down to South Derbyshire in Swadlincote. Chesterfield, Doncaster and Sheffield Rapid Relief Team volunteers worked tirelessly together to serve hot meals and refreshments and temporary flood lights through the night. “Sofa Surfing” is a term used by people with no fixed abode, who resort to sleeping every night on a different sofa, often with people they don’t know. The adapted 2 seater sofa complete with surfboard was pushed and officially started off by Deputy Police Crime Commissioner Hardyal Dhindsa. He said “I’ve done 2 laps and I hope it makes other people come and support”. 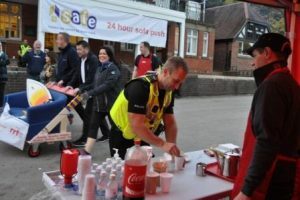 The Sofa Push was maintained constantly 24 hours and pushed by supported Homeless and vulnerable young people aged 18 to 25, along with supporters and volunteers from local businesses and members of the public. Darren McQuade of Chesterfield FC and team members show their support of the homeless and keep the Sofa moving! The Sofa relay never stopped …changing hands to a squad from Chesterfield FC including Darren McQuade and team mascot “Chester the Mouse”. Chester found the cheese in the RRT Marquee a major distraction, making regular attempts to take a slice! 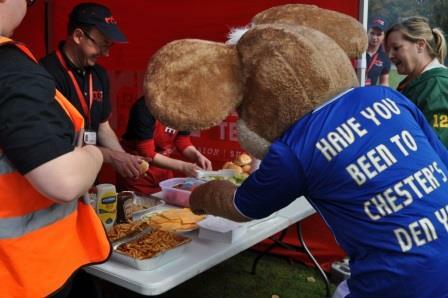 Chesterfield FC’s Chester the Mouse mascot…after the cheese again! The staff at SAFE Charity do a fantastic job helping homeless youngsters into settled shelter, guiding them with life skills, money management and how to find employment. Rapid Relief Team also gave 60 hygiene packs and 16 food boxes to homeless people at the event. 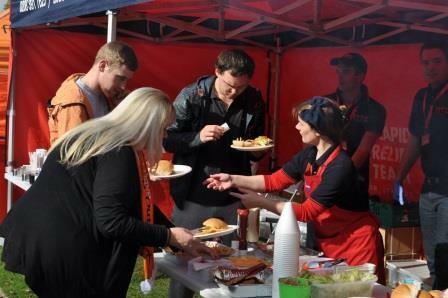 Meal after meal…over 200 hot meals served in 24 hours! 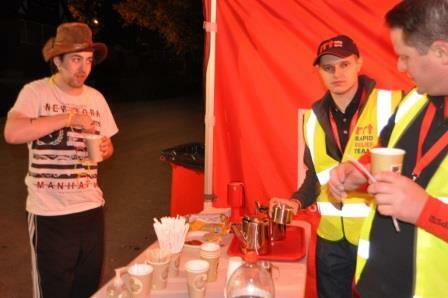 Thanks to RRT on that day, they brought confort to homeless people .